The Shamshir is a Persian weapon (in Farsi, it is translated as 'sword') that came to prominence from the 13th to the 16th centuries, and has been immortalized in film many times as the sword used by the Saracens against Knights on the first holy crusade. As usual Hollywood will not let the facts get in the way of a good story, as in reality the Saracens had straight blades much like the crusaders swords, and that the Shamshir only came to prominence after seeing how effective the cutting swords of the Mongol invaders proved to be, and thus inspired, created their own version. And they did an excellent job.. Despite being so effective at what they are designed to do, there are only two companies in our target sub US$300 price range making a functional replica of any note: Windlass Steelcrafts of India (reviewed here) and Cold Steel. The Cold Steel 88STS really is a thing of beauty. With deep brass fittings, a black handle and scabbard - the color scheme is simplistic, yet the combination actually works extremely well. And it is true that when swinging this sword, the hand does tend to slip down the handle. But the 'pommel' for want of a better word arrests any further movement, and after some initial trepidation I soon felt that the grip was surprisingly secure, comfortable and even snug. 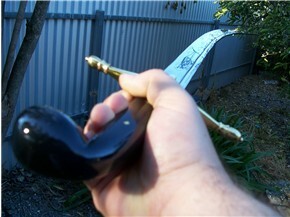 Especially when held in a handshake grip - which is, from my understanding, the optimal way to wield a Shamshir. Unfortunately, the actual construction of the hilt remains unknown and I cannot say for sure what it is made from. Everything is very tightly assembled however, with no looseness or undue movement anywhere in the assembly. Moving on - the cross guard of the Cold Steel Shamshir is less elegant and more simplistic than the Windlass version, though essentially it is the same basic design. The two brass arms are the same, terminating in delicate and attractive looking oval shaped lobes while the top and bottom of the cross guard stretch out to form what looks something like a 4 pointed star - which in the Windlass version is overlaid with a secondary star pattern. Also as a point of difference from the Windlass version, there is no seating in the mouth of the scabbard for this lower protrusion, but rather it slides neatly over the top of the brass plated throat. Otherwise though, the scabbard is IDENTICAL in design with the same chape, stitching and suspension loops - the only difference being that the Windlass Scimitars are all nickel plated while the Cold Steel model is brass. Lightweight and curvaceous is perhaps the most apt description of this fine 1lb 13oz sword. Lightweight in part because of the perfect fuller that follows parallel to the spine, carefully following the contour before terminating some 5" from an acute and deadly looking tip. And curvaceous - I think the image here pretty much speaks for itself. All in all, it really is very nicely done. The first half of the blade is almost straight. However it starts to rapidly curl somewhere towards the middle for around 5" to create the distinctive wicked curve. Now there was no doubt that it certainly felt sharp to the touch. And in the accompanying Cold Steel sword inspection sheet, it was noted and signed off that: "The blades must be razor sharp. If the sword does not cut the Cold Steel Stationary, it must be sent back to the polisher/sharpener for rework". And truth be told, the geometry of a Shamshir would make them great cutters even with only the most minimal edge. There have been persistent rumors that Windlass Steelcrafts makes several sabers and the Shamshir for Cold steel to their specifications. It is no secret that these particular swords are made in India. Indeed, the inspection sheet was signed off by a Mr. Keshav Verma. And the similarity of designs seemed to be more than just coincidence. Can you see it? It is extremely hard to photograph - but it was the smoking gun I was looking for... Before it had been polished away, it was obvious that this bare blade had said 'Windlass, Made in India!'. Yup, it seems that the rumours were now confirmed! Now before anyone gets too excited, this should come as no shock. Windlass have some pretty good technology and make some beautifully tempered blades, so indeed - it makes sense that Cold Steel would use them to create their Indian made products. 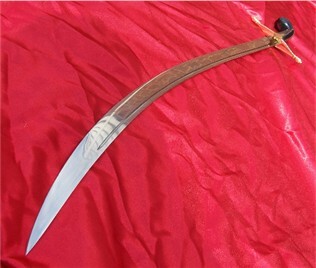 (I should even note that I found this as a reassurance that the Shamshir were made by Windlass and not another less known Indian forge - some of them make some pretty crappy stuff). But I consider myself pretty lucky to have received a sword that solved this puzzle! Knowing now who had made these swords, as well as taking stock of this swords geometry and the keenness of the edge, I was quietly confident that it would be a very rewarding cutter. But before any test cutting was to be performed, I was curious as to how these could be used for an effective thrust. In the Cold Steel Shamshir blurb they allude to this, saying that "contrary to popular belief, it was very effective at delivering rising, descending and hooking style thrusts!" Well, I had to put it to the test! I was quite impressed. 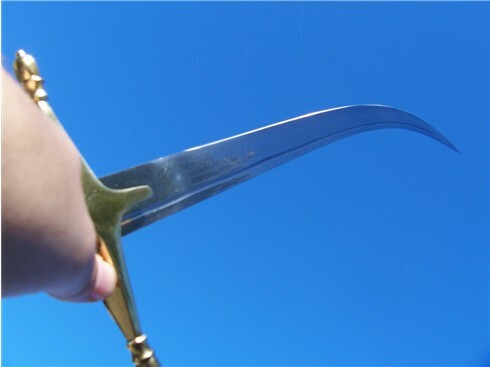 The curve of the Shamshir opens up several new angles of attack, and even after a few goes it was clear to me that they could be incorporated into a fighting style to deliver fast and unexpected attacks from unfamiliar angles, followed by a cut. Naturally I was secretly impressed by how well these swords had performed. They had slashes the light targets to pieces without any troubles. However, my first cut sailed on through without a problem . And I began to enjoy myself as I stalked the target and proceeded to slice and dice it from various angles, each time slicing clean through. Now THAT is what I call a sharp sword! As you can see, the final target - a 3" diameter thick tree limb, was severed easily in two places from a single stroke with no transference of shock into my hands or jarring. It was clear that even these replica swords were sharp and sturdy enough to handle a wide variety of targets without sustaining even the smallest amount of damage, and the blade largely looked the same as when I first started the exercises, with only the barest of scratches. However, as I bought it for US$209.99 at Trueswords.com, (which is LESS than the Windlass piece), I think that the decision as to which one to get is quite an easy one. The Windlass version is more traditional and slightly more ornate. 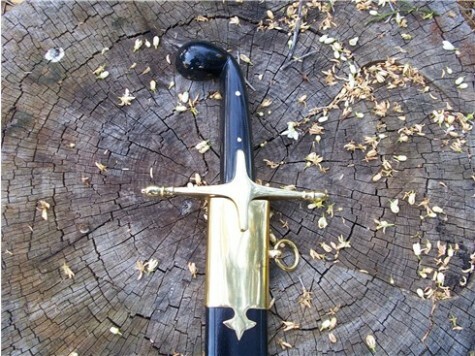 But the mean black and brass Cold Steel sword is a real user sword - not to mention it is a very enjoyable sword, both from the perspective of its uniqueness, its utility and its deadly beauty. As I mentioned, the official cold steel price of $379 is a bit rich. And Trueswords no longer actually stocks Cold Steel products anymore (I bought this sword back in 2007) - so the best choice for quality and price would have to be here at Kult of Athena where they are available for $229.99 - which is only a tiny price increase considering how many years it has been on the market. Tried, tested and true.